On the heels of the historic passage of health reform legislation last night on Capitol Hill, it’s no surprise that it was on everyone’s mind during today’s Opening Session of the APHA Annual Meeting in Philly. In fact, APHA Executive Director Dr. Georges Benjamin kicked off the session with a big smile and this quip: “How’d you like that House vote last night?” And by the sound of the whooping applause, it seemed everyone liked it, indeed. “Environmental protection is public health protection,” Jackson said. 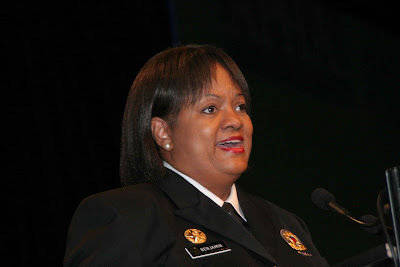 Near the end of her speech, Jackson called on the public health attendees to get involved in reforming the nation’s chemical management law, known as the Toxic Substances Control Act. Since the law's creation in 1976, EPA has only regulated five chemicals out of tens of thousands, Jackson said. (Shocking, right?) And with today’s kids receiving a steady infusion of chemicals even before they start to eat solid food, it’s time for a change, she said, asking for attendees’ help in making it happen. “Help us do a better job of bringing our work together,” Jackson asked attendees. Finally, filmmaker and granddaughter of legendary ocean explorer Jacques Cousteau, Celine Cousteau, spoke before the crowd to tell the story of why the health of the world’s oceans is also important for the health of the world’s people. 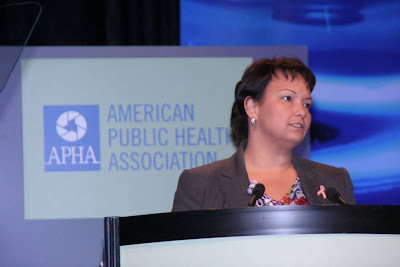 I thought Lisa Jackson did an amazing job linking environmental issues and public health during her speech. It was encouraging to see a clear plan of attack in reforming national chemical regulatory framework (TSCA) -- something I knew nothing about before the opening session. Check out my public health blog -- http://veritashealth.blogspot.com -- to read more on this issue and follow my activities at APHA 2009.